It was hard to get my father to talk about his childhood. Even when I conducted an oral history interview with him (parts of which appear elsewhere on this site), I had to probe repeatedly to elicit much in the way of detail. I think he was one of those people who truly don’t remember their childhoods in the same vivid detail as I do. Questions about where he came from were usually met with his stock response, “I’m a native of where I’m living now.” Still, though many of the puzzle pieces are missing, I think I have managed to learn a bit about his formative years. Both his parents were artists. My grandfather was a classical pianist who studied with Josef Lhevinne at Juilliard and concertized for a living until the advent of the radio reduced the demand for live performance and he was reduced to supporting his family doing clerical work. My grandmother was a professional elocutionist and actress who also painted and wrote poetry. I picture their household as resembling the Alcotts’, with a succession of visits by artists and intellectuals. How surprised they must have been by their eldest son’s strong bent for math and science. But apparently they took it in their stride and encouraged him to follow his lights where they led him. On July 22, 1939, he and my mother, Elsa Dahart, were married in the All Souls Unitarian Church in Washington, DC, where he was working at the time, by Dr. A. Powell Davies, a distinguished member of the Unitarian pantheon. Sometime after that my parents moved to Long Branch, New Jersey, and then to Neptune, New Jersey, where my father had taken a position at the Evans Laboratory in Belmar, New Jersey in signal detection and the development of radar. I was born in February of 1943. I like to think my parents named me “Cynthia,” the Greek version of Diana, goddess of the moon, in a moment of prescience, though I have no idea whether that was so. Although we were not a physically demonstrative family, I always felt that I was valued and cherished. The nurturing environment, however, was probably more my mother’s doing. 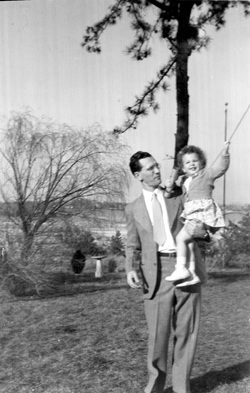 My father tended to relate to children as miniature adults. One of my cousins still remembers his showing me how to change a tire and explaining torque to me; I was four years old at the time. ​In Neptune, we were part of the small year-round population of a summer beach resort community where a lot of homes stood empty all winter. Today it is all paved roads and marinas and lawns, but when I was little it was very rural - not agricultural, but mostly gravel roads where you could ride your bike and not pass any houses or see any people for long stretches - something no child would be permitted to do today, but - times have changed. Yards were mostly sand and rock gardens; you couldn’t have a lawn unless you brought in topsoil, and we never did. Until I was 5 my parents rented a tiny house down near the Shark River from a couple who brought in a little extra income by vacating their home and residing in an apartment over their garage. We then moved to the corner of Pinewood Drive and Hampton Court, to a very comfortable house that was baronial in size compared with the little rental. It had screened-in porches front and back, where we slept on very hot nights, and where we played with cards and jacks and pickup sticks and ouija boards (remember ouija boards?) all summer; and a floor plan that allowed our electric trains to disappear into another room and circle around a wall before reappearing. Not sure who loved those trains the most, the children or their father! I wish I could give a firsthand account of Project Diana, but although I have many clear memories from that era of my life, including the birth of my sister Leslie in 1945, the excitement surrounding the successful moon shot isn't one of them. David Mofenson, my earliest friend and fellow Project Diana legacy (the Signal Lab families tended to socialize with each other more than with outsiders), recalls these moments vividly, so perhaps this isn't the sort of thing little girls tend to hang onto; in any case, not this little girl. What I do remember is accompanying my mom to pick up my dad after work - we only had one car - and waiting outside those old Marconi Lab buildings for him to emerge. I suppose because what went on inside was top secret, we never went in. The first time I ever stepped inside those buildings was many decades later, after they were reclaimed by InfoAge, the wonderful brain child of a local history buff named Fred Carl. In 1948, my father took a job with Reeves Instrument Corporation in New York City and began several years of commuting by rail (including a running bridge game on the way in and reading detective fiction on the way home), punctuated by frequent business trips around the country. At that point he became a weekend father, leaving my mother to shoulder most of the burdens and pleasures of child-rearing. Still, he was very much present most weekends, and my Saturday morning memories of my dad are of the lower half of his body jutting out from under his car. (Brat that I was, I used to tell him if you looked long enough and hard enough, you could probably find something wrong with almost anything.) We never needed a plumber or electrician because he was an amazing Mr. Fixit who could take on just about any washing machine or toaster that dared to break. He also became an avid outboard motorboater during these years, an interest that persisted even after we left Neptune. We had a series of vessels with names consisting of the first two letters of each of his children's names - first CYLESH and later CYLESHRO. In 1956, Reeves moved to Garden City, Long Island, and the railroad commute from Neptune was no longer feasible. He considered changing jobs at that time, which also would have involved moves (to either California or Michigan), but in the end he stayed with Reeves. After a little house-hunting, my parents realized they could get a better house by living further out on the island, so my father was again relegated to a 45-minute commute, this time by car. My mother thought Long Island was too flat and chose Northport because it had hills. Our real estate agent spent a day driving us around and scoping us out before telling us there was a house for sale at 118 Stanton Street, next door to her own. It truly was a wonderful house, with a bay window, a Dutch front door, knotty pine paneling, a beautiful tilework fireplace, bedrooms with special features (mine had a balcony and Leslie’s had a loft), and a huge green yard, a novelty for us. We all fell in love with it immediately. A bonus, especially for my dad, was an active Unitarian fellowship located just a few miles away in Huntington. It was the first time we ever lived closer than 30 miles away from a Unitarian church. Another bonus was the opportunity to pilot the latest in the CYLESHRO series across the 8-mile expanse of the Long Island Sound (usually including one of his typical drive-in, drive-out visits to friends in Connecticut - which turned into fly-in, fly-out visits after my mother died and he took up flying). My parents’ relationship was amazingly harmonious, something enough others have commented on to convince me I’m not selectively forgetting unpleasant moments. I never remember hearing them argue, let alone raise their voices to one another, I tended to attribute this to submissiveness on my mother’s part, but having watched my father’s equally courteous behavior with his second wife, Rose, whom he married three years after my mother’s death in 1965, I think it also speaks to his fundamentally gentlemanly nature, as well as to his proclivity for choosing gentle and forbearing women as his life partners. Although both his wives were mild mannered and softspoken, my father always admired high-powered professional women immensely and counted many among his wide circle of friends. It was from him, much more than from my mother, that I received the message that women could do anything and be anything they chose. (She used to joke that it’s just as easy to love a rich man as a poor man – at least, I think she was joking!) He strongly urged me to take all the math and science I could cram into my schedule and made sure I enrolled in AP physics and AP calculus, something I’ve never regretted as it has opened doors that would otherwise be closed to me. My father's gadgeteering proclivities led to several patents - the most lucrative of which was an electronic thermostat, an updated version of which can still be found in most houses. The patent was infringed on by Honeywell, which reverse-engineered the product and marketed it on a scale beyond anything Reeves Instrument could have dreamed of. My father won a court case against Honeywell, resulting in a royalty stream that lasted for many years. He always said he had the best of both worlds with this arrangement and claimed it put me through college. Sometime during the 1970s, my father’s career took a disastrous turn. Back in 1955, Reeves had merged with Dynamics Corporation of America. When the electronics industry fell into a deep slump, the merged operation pulled up stakes and moved to Florida in hopes of riding out the downturn by lowering expenses. It seemed to work, but not for long, and when DCA went bankrupt, it took Reeves down with it. First to be paid off were the stockholders and creditors, leaving precious little for the senior executives at Reeves, including my father, who lost their pensions. To eke out a living, he took a series of consulting jobs requiring him to live in seedy motels and tiny furnished flats all over the country - until he finally secured a job in Electronic Warfare at the Pentagon. All his years at Evans Lab had qualified him for a government pension, but the amount was based on his highest three years of salary, the famous federal high-3, and for him those years were 1946, 1947, and 1948. The Pentagon job enabled him to accumulate three more years, enough to provide an adequate retirement income. So his heroic efforts paid off, and in the end he landed on his feet. It wasn’t until I myself reached retirement age that I fully understood the gravity of his plight. But although he was perfectly capable of a good rant, I never heard him complain about the injustice of his situation at a time of life when he should be winding down rather than revving up. I could say so much more about my father – his love of language and his gregarious nature, both, I think, unusual in an engineer, especially in one who was in most respects the quintessential engineer. I could talk about his encouragement of dinnertime debates and his favorite saying, “It ain’t necessarily so.” I could carry on about his love of gadgets (passed on to at least two of his four children, my brother and me) and his famous misshapen suits, weighed down by the gadgets and papers and books he stuffed in his pockets. But I will leave those threads for others to pick up and just state for the record how lucky I feel to have had him for a father. Love you, Daddy.